This dress is made in silky chiffon so have no doubts regarding the comfort. This fabric feels soft to the skin. The neck is wide and the straps a little ruched. The centre of the bust has floral embroidery. The rest of the dress has ruffles running at the centre till the end. 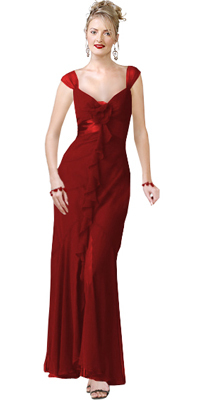 Captivate the boys in this prom gown.